Better people decisions drive better business outcomes. Save time in the hiring process. Reduce hiring and turnover costs. Increase your sourcing funnel immediately. Be confident in 100% compliance. Supercharge recruiting with powerful data to make smarter decisions. For key talent decisions, from the interview through reference check to onboarding, timely performance check-ins, and exit interviews, Checkster gives you a consolidated, real-time view into the quality and fit of your people. 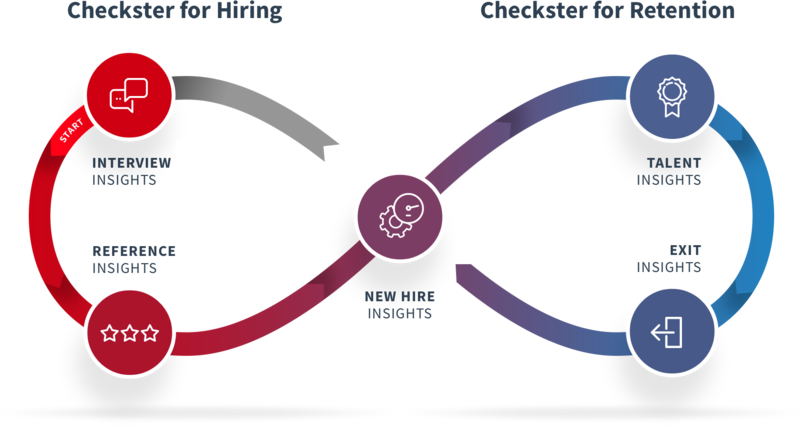 Using collective human intelligence, Checkster empowers talent and team leaders to make better hiring decisions, build high-performing teams, and improve retention. "Checkster brings us the power to be extremely efficient while getting in-depth tailored reference assessments." CEO & Founder, Accolo, Inc.
"From a quality and compliance perspective, our references are 100% better than what they used to be. We’ve been able to improve the compliance of what the referee has actually said, which has been great for our business." "Checkster helps us get to the best people in a tight market. We’re making offers faster and gaining a competitive edge to get to the best candidates faster."